Actual launch times vary: To keep our Meyers Beach Tours small and personalized, ideally between 6 and 12 people, actual launch times may vary by up to 1 hour. We will reach out to you via text or phone call a day or two prior to confirm yours or your group's actual launch time. 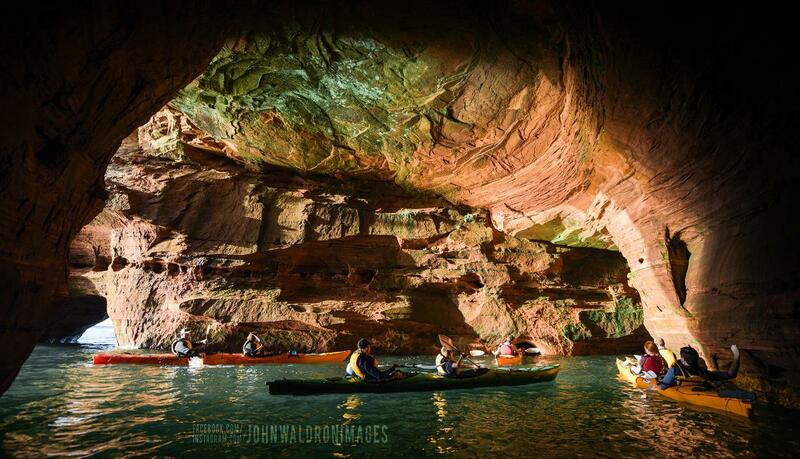 Meyers Beach has the best and biggest caves in all the Apostle Islands. We'll explore all the caves of Meyers Beach and spend time with the sea stacks, tunnel caves and sea arches on the back end of the sea caves, where it is less crowded. This is the section of caves that became famous as the ice caves, they are absolutely breath taking. It is a 1 mile paddle from Meyers Beach to the first cave where we begin to explore all the nooks and cranny’s.